The new Volkswagen SUV, which is now being tested in the USA, can be called Teramont. Volkswagen applied for the registration of the name Teramont on the 8th of December 2015. At the end of July 2016 the CEO of the North American VW office Hinrich Woebcken didn’t want to disclose the name of the new crossover, only implying its first letter as Ford Fusion led tail lights. Woebcken told that the head office of VW in Germany insisted on the letter “T”: in accordance with the corporate plan, the names of German crossovers must always start with this letter. At the same time, the regional office of Volkswagen was allowed to choose the name of the new car, recommending to use the “American-style name”. 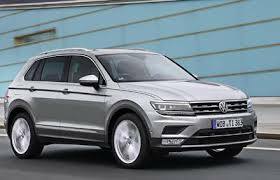 Now the VW model range includes the crossovers Tiguan and Touareg. The names of the most of the latest German conceptual SUVs started with “T”. Particularly, the prototype of Touareg of the new generation was called T-Prime.